Your letting go is your strength. Your self care is your grace. The demands of motherhood are real. Some moments are blissful and profound, others are messy and exhausting. I often think, “how did my mother do this?” Then, I am reminded of her steady, calm, and loving presence and that I too can hold that space. Parenting teaches us about the power of letting go and directing our attention to the present moment. From the demands of daily schedules, to the emotional outbursts from our children, to the organization it takes to care for our families, our personal self care can be overwhelming and the last item on our to-do list. Even five minutes on the mat can welcome a feeling of being grounded. Let’s face it, the long deeply relaxing and satisfying two hour home or studio practice followed by a walk or run in nature is not often the reality of motherhood. It can be daunting to find time to practice yoga at home or even make it to a studio. Yet, when we truly let go of the outcome of what our yoga practice looks like, what we can receive on the mat may surprise us. 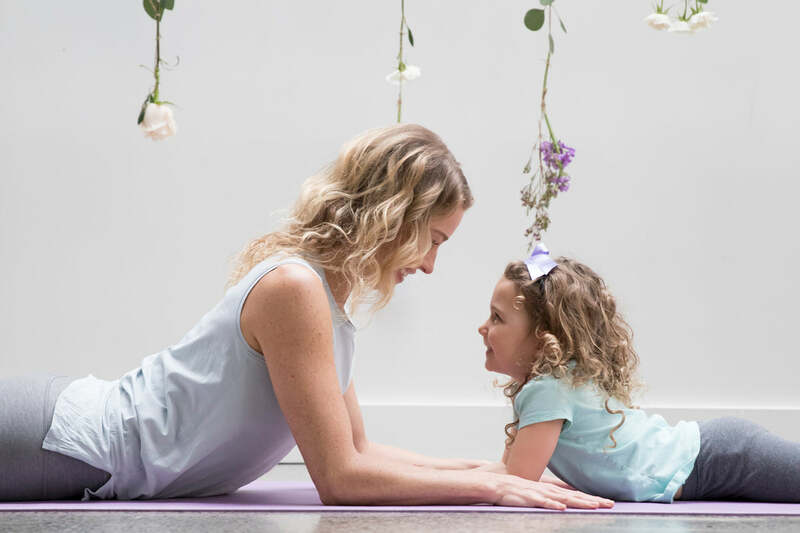 Ever since my first daughter was a young baby, I would place her on a mat beside me, she would coo and kick as I would move in and out of the yoga poses. She would sing her baby talk while I sang mantras and chanted my Om’s. It was so clear that our time together on the yoga mat was pure connection. We both received such a simple joy together. Now that I am a mother of two, I have learned how to create a home practice that includes both of my children. 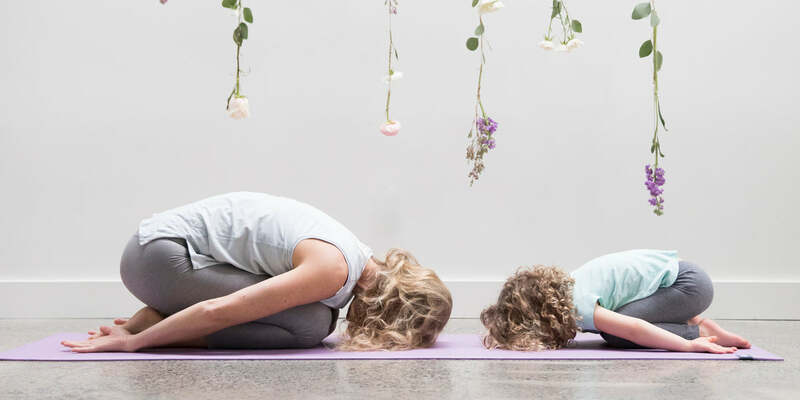 I know and feel the importance of my home practice, and I can see how it has supported my children to self regulate their emotions through breath and movement and to feel the joy of connecting with their Mama on their mats! 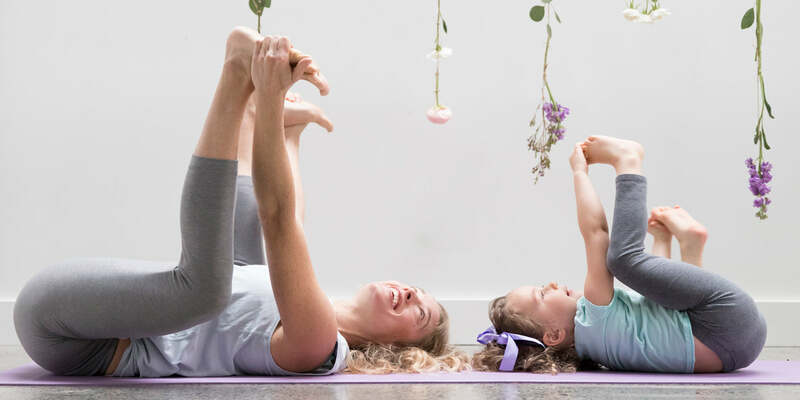 Our family yoga practice has taught us all about a deeper connection to self and each other. Remember to start off with a couple of postures, and let go of expectations. 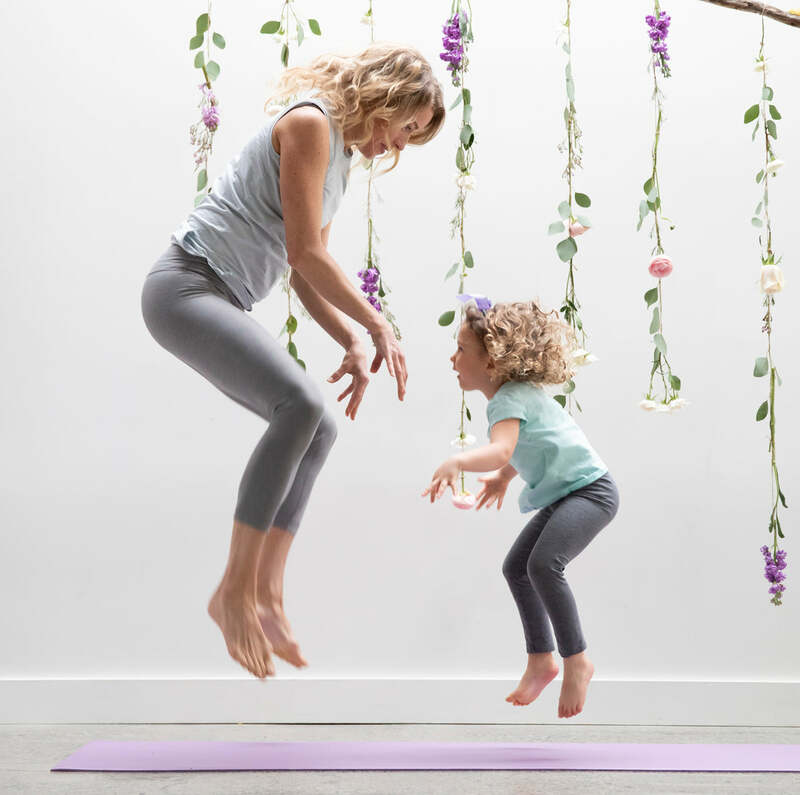 Have fun, be playful, and Mama — get your practice on! 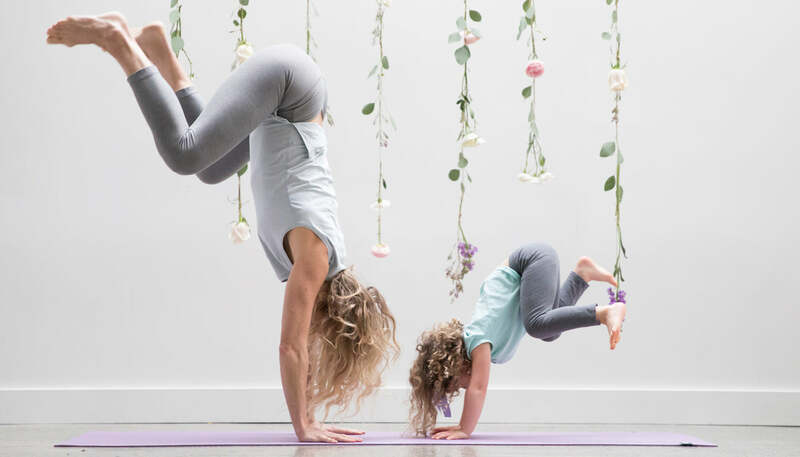 Place yoga mats out for you and your children. However many children are present is however many extra mats I put down. Whenever I practice, my children are welcome to join me. This way they don’t feel excluded but rather they feel connected. The yoga space becomes an open invitation. Have some yoga books/yoga cards for children with pictures in the space for inspiration. Have snacks, small toys, and colouring supplies. 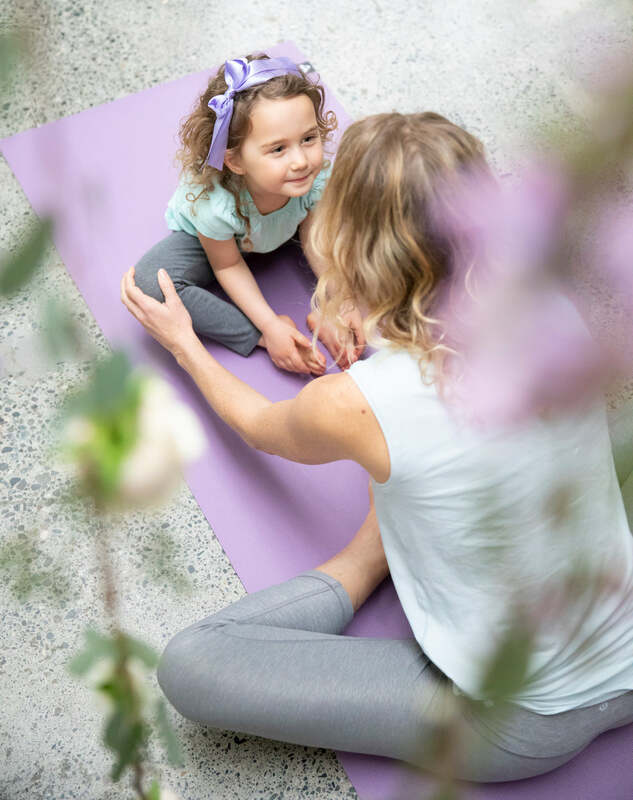 If you are following along with a yoga video, make sure the device is out of reach to the little one's hands. Put on some music that will inspire your practice. Sometimes I put on my three year old’s music, sometime my seven year old’s, and sometimes, if I’m lucky, my music gets played! Share your gratitude for your kids while your practice and encourage your children to move in a way that feels good. Let them follow some of your movements. 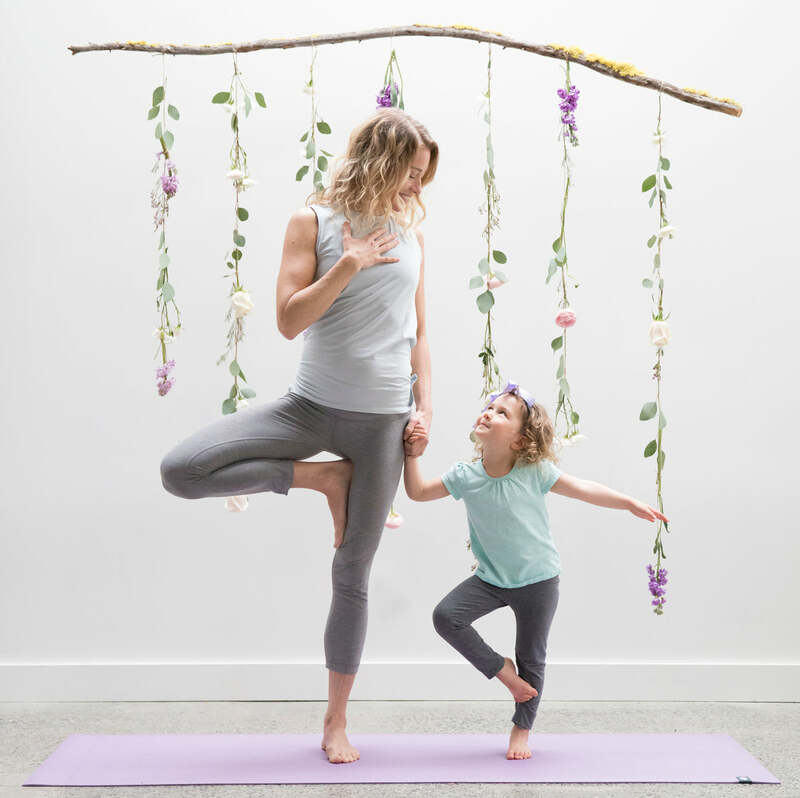 Finding inspiration in the shapes from nature is a great way to encourage yoga for kids. For example, be a cherry blossom tree with branches gently flowing in the wind, or, be the eagle soaring. Don’t give up. 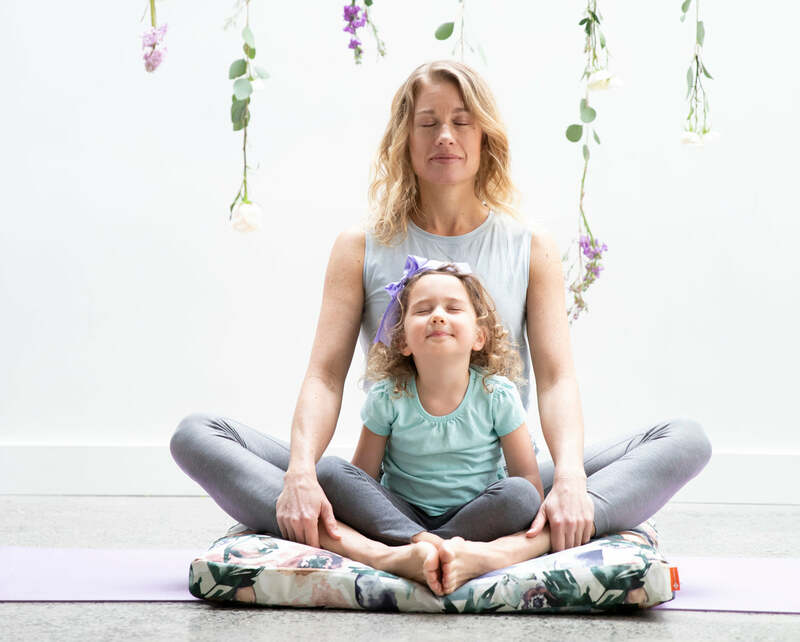 I have found that my children flow in and out of the practice, and I get in a great home practice when they feel comfortable and included in the space. Release all expectations of the outcome and the amount of time you get to practice for. Sometimes it’s five minutes and sometimes it’s an hour. 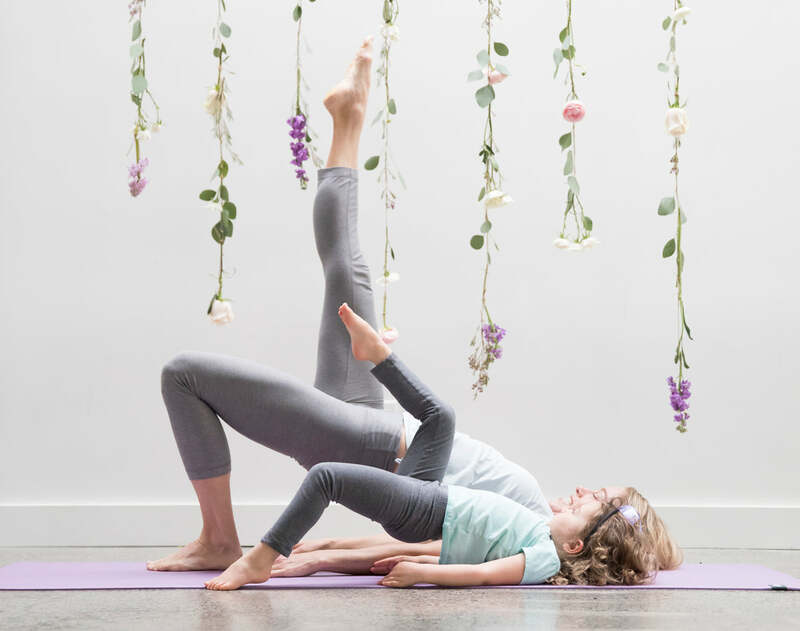 Through the art of self care, whether it be ten minutes on your yoga mat with your children climbing on you, a run in the forest, gardening, take a bath, or an afternoon nap, you will find yourself filling up your own mama temple. Your sleep may increase and your joy and happiness will allow you and your family to become more connected and grounded. Once you get started, it will be with you and your children for life. Depending on where your child is at and what kind of energy they have (high or low) you could begin with a free dance party to shake off, warm up, and get into the zone together. Begin with knees tucked under the body and draw arms by your sides. Close your eyes and rest your forehead on your mat. Listen to your breath. Listen for your heart beat. The Earth too beats like your heart. Imagine you are a little seed in the earth starting to grow now. From your little seed in child’s pose, come to your hands and knees. Begin to sway your spine, first like a cat and look towards your belly button. Then sway your spine like a cow, looking up towards the sky and letting your belly relax towards the earth. Repeat this six times, try making the sound of the cat and the cow as you move. Come to lie on your belly, prop your forearms under you to lift your chest up. Straighten your legs behind you. Shine your heart forward and take three relaxing breaths. Now take three lion's breaths and each time you exhale, stick out your tongue and roar like a lion. Transform your cobra into a blue whale. Flip onto your back, place your arms by your sides, walk your feet under you, and lift your hips high. Breathe in slowly and as you breathe out, imagine you are spurting water out of your belly button — just like the whale’s blowhole. Transform your whale into a baby animal of your choice. Lie on your back, and hold onto your feet, gently sway like the wind. Let your baby animal relax and sing or make soft sounds. Let your baby animal roll to a frog squat facing the front of your mat. Imagine yourself to be a frog with strong legs. Take three deep breaths and when you feel ready, push down into your hands and feet and spring forward like a frog. Do as many as you like and make the sound of a frog. Let your frog transform into your favourite tree. Stand tall and feel both legs and feet be strong into the earth. Breath three deep breaths here. Balance on one foot, and bring the other foot to the inside of your standing leg. Bring your palms to touch in namaste mudra. Breathe here and repeat on the other side. Make your way back to down dog, spread your fingers and straighten your arms. When you feel ready, bend your knees and take six little donkey jumps. Have fun getting some air and make donkey sounds. Sitting in the centre of your mat, bring your feet to touch, and hold your feet. Let your butterfly wings (legs) flap and imagine your butterfly flying in the warm wind. Try to touch your forehead towards your toes and take deep relaxing breaths. Savasana Lying onto your back, put a blanket over you and have a soft toy to cuddle or hold a crystal in each hand. Close your eyes and let yourself be quiet and still. You can put on a relaxing piece of music here or you can sing to your child. Try to let your breath be as relaxed as when you are sleeping. Come up to sitting crossed legged on your mat. Bring your palms to touch in namaste mudra. Take some deep relaxing breaths, or sing a mantra/special children's song here to seal in your yoga practice. In her yoga teachings, Mara weaves together her background as a dance artist, her practice in the shamanic tradition, and her twenty years of experience on her mat – naturally what arises is a fluid, earthy, full bodied practice. Currently, Mara hosts international yoga retreats, fuses yoga and corporate leadership to executive teams, teaches professional athletes and artists, mentors yoga teachers and teaches classes/workshops. Mara is a mother of two in Vancouver, BC. Find out more about Mara on her website at www.marabranscombe.com.